I’ve always cherished Yi for the deep connection it offers to guidance – the way it clearly, bluntly and compassionately speaks the truth. I imagine it’s the same for you… ? There’s that moment of recognition, when the light flows in and you can see. It can be dramatic (tears, laughter, yelling at the book…), or subtler (a wry smile, freer breath, a gradual sense of something unlocking) – it’s all part of conversation with this extraordinary, beautiful, challenging (!) oracle. Probably there are still moments when you don’t ‘get it’, when you’re confused or overwhelmed by a reading and don’t see how it connects. (That’s OK – the key is to know how to respond when you’re stuck.) Still, you’ve received so much from Yi that of course you’re curious to learn more and go deeper. Learning more will give you more confidence in your readings – a quicker intuitive grasp of what Yi’s saying, or a fuller understanding of a reading’s subtleties – and maybe also enable you to share this gift with others. This is why I created Change Circle: a sort of refuge, library, Aladdin’s cave, and shared campfire for lovers of the Yijing. 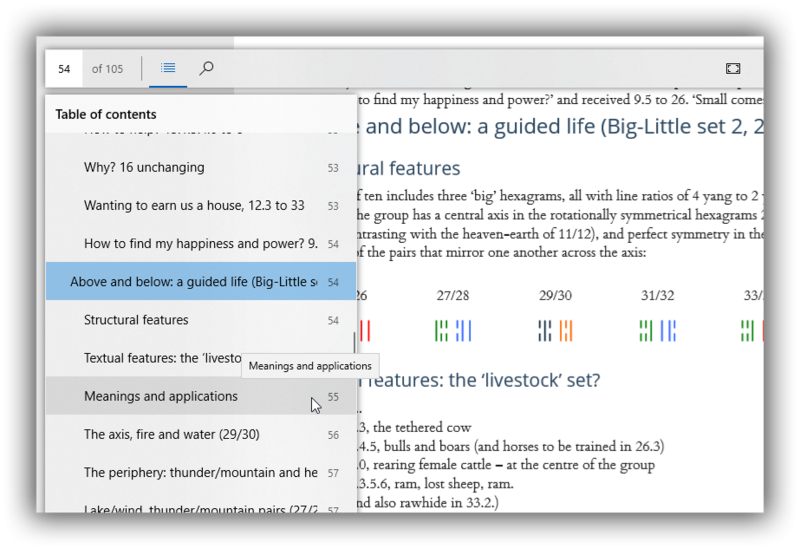 It’s here so you can always connect with like-minded people, explore further and deeper into the endless layers of the Yi – and get individual help with readings when you need it. Everything in Change Circle – community, teaching and reading support – works together to deepen your knowledge and experience of Yi. Since I find your work on the Yijing to be highly valuable and very helpful, it seems natural to me not to miss all the opportunities offered by membership, to have early access and/or discounts on products and so on. Equally important, being a member of Change Circle is a way to support your work. As a matter of fact, 90% of the times I log in is to consult the WikiWing, but I also think it’s great to have a reserved area of the forum where you can discuss personal readings without exposing them to the world. You’re welcome to join any time. 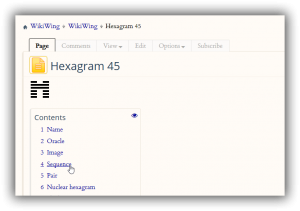 As soon as you do, you can tap into a rich library of Yijing resources, reach out to talk readings with fellow-members, and book your first I Ching chat with me. one-to-one I Ching Chats. 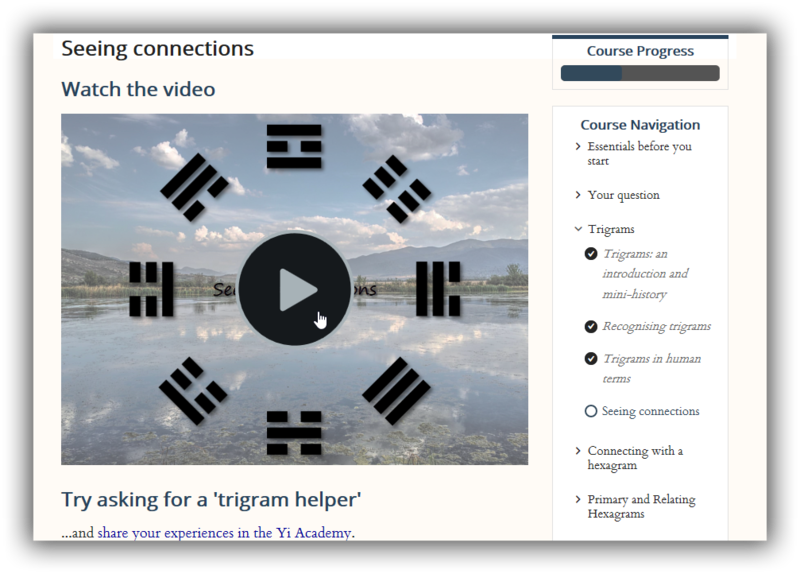 If you have a reading or part of a reading you’re stuck on, or a hexagram that keeps coming back until you get the feeling you must be missing something – or any Yi-related question – talk to me, and I’ll help. 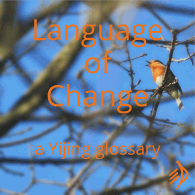 Change Circle is not just a store of knowledge, nor even just a place to go for help with readings: underpinning all that, it’s a gathering of people – as fascinated and curious about the Yi as you are. You get to see other facets of the Yijing through the experiences of your fellow members. 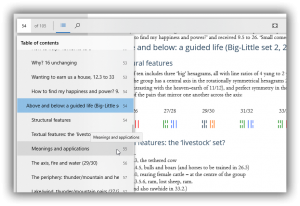 We have the Reading Circle forum for sharing readings (and dreams, in the ‘Dreams and Yi’ space) privately – and also the Yi Academy forum, a safe learning environment to try out new interpretive tools. I’m available in all the forums to answer questions and offer reading feedback. As you know, you learn the Yijing through your own reading experience. However… you can also learn a lot from other people’s experiences – especially when those experiences are illuminated with the benefit of hindsight and made easy to access. This is the particular gift of WikiWing, our collaborative Yijing book. It started life back in 2015 when I first ‘seeded’ the Wiki with my own notes, and has been growing steadily ever since. Each of these three elements – learning, readings and community – nourishes the others and multiplies their effects. The more you grow in confidence with Yi, the more you can contribute and help out relative newcomers (this is an ideal environment to practise reading for others); the more you share your experiences, the richer the whole community becomes. The trigrams and their directions were the juicest part of the Foundations Course for me, but I can’t think of any one thing more useful than another – all of them were! 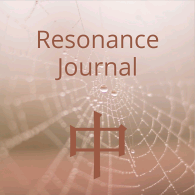 – and I now approach an I Ching reading in a deeper and more transformational way. Instead of just blindly following an I Ching book interpretation, I can contemplate a while and choose a personal way of understanding my casting. As well as lifetime access to the course, you also have three months’ access to the Yi Academy forum, where I’ll be glad to answer any questions you have. 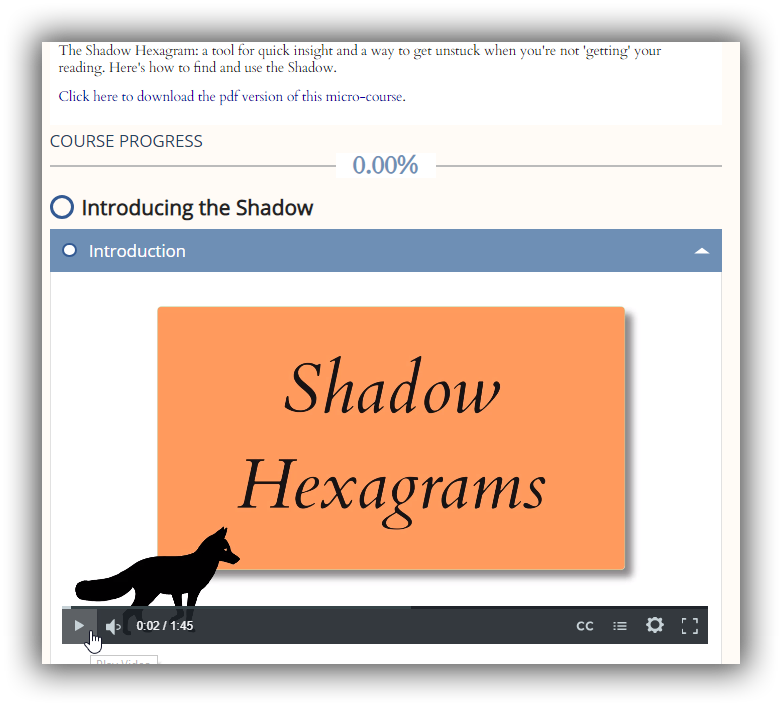 This mini-course on Shadow hexagrams (and how to use them to get unstuck) was also added in 2018. 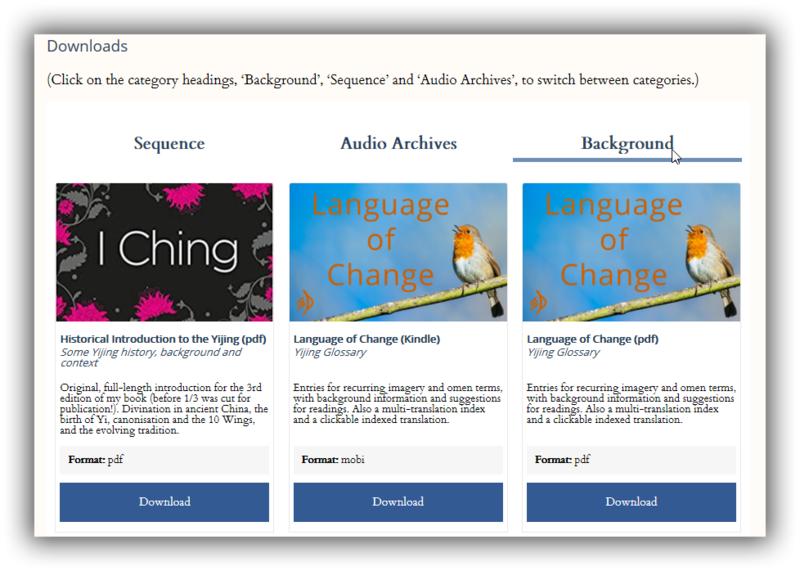 The popular I Ching chat service costs £30 for non-members, but it’s included in your Change Circle membership for no additional charge. Whenever you’d like help with a reading (or anything else Yi-related), just visit the members-only booking page and choose a convenient time for us to talk. 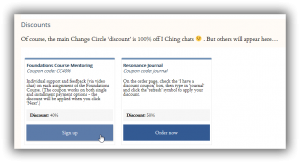 Change Circle members also get discounts on – basically – anything that isn’t already included in the membership for free, including live classes and full Yijing readings. About the ‘Exploring the Sequence’ book – I am in awe of this resource! It is fascinating and so much work went into it. Also I pretty regularly return to the Foundations course for refreshers. And participating in the two Open Reading series has been a valuable learning experience for me. You can’t really put a price on an online membership like you would with a daily coffee, can you? And it’s not as if there were a lot of I Ching memberships to compare with. The last I looked, a comparable tarot membership (with resources and forums, though definitely no one-to-one chats) cost $27/month – better value than the daily coffee! But still… Change Circle’s a community as well as courses, so I don’t want to price it out of reach. Let’s have a basic price of £10/month (about $13 or €12) – and beyond that, pay what you want. If it feels good to you to pay more than the £10/month, then thank you. And if not, then thank you, too, for joining. 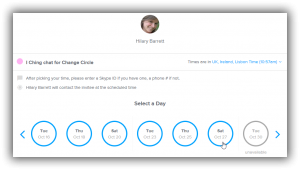 Obviously, you can cancel your Change Circle membership any time. But in addition to that, if you want to leave within the first 60 days of your membership, simply let me know and I’ll refund everything you’ve paid. No questions, no hoops to jump through and no hard feelings. Why two months, not just one? Because I want you to have plenty of time to see and use all that’s included before you have to decide. There’s enough time pressure in the world – why add more? I’m a member of Change Circle because it’s more private and it’s also a way I can contribute financially to Clarity. I would recommend it to anyone who is seriously interested in exploring the I Ching beyond the basics. Someone who is willing to spend more time with Yi’s responses. 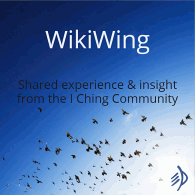 How is this different from the free I Ching Community forums? There are three big differences. 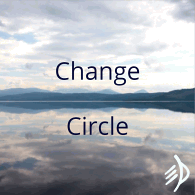 Second, the Change Circle forums are private: for members only, and guaranteed Google-proof. 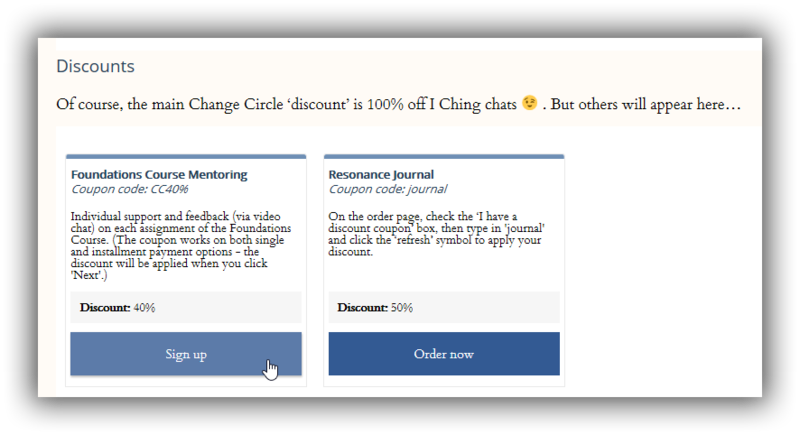 And finally, Change Circle is not just forums: it’s also a centre for learning, including the Yijing Foundations Course and much more. How is this different from the free Beginners' Course? The Beginners Course takes absolute beginners from zero to casting their own readings, with just a few tips on interpretation at the end. 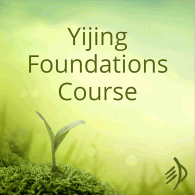 Yijing Foundations starts where the Beginners’ Course leaves off, and walks you through how to interpret the casting: primary-relating structure, trigrams and changing lines. And the further learning materials in the Library go beyond the essentials into advanced interpretive tools, for exploring the depths and subtleties of a reading. What if I don’t like forums, or don't have time for them? Change Circle is a lot more than forums: there’s WikiWing (where shy people can contribute anonymously), a whole library of courses and articles, and as a member, you are absolutely welcome to book a chat with me any time. Actually, some members never post in the forums at all. How could I cancel my membership? This will forward you to the payment provider (where you originally set up your payment agreement) to complete the cancellation. Why forums? Why not a Facebook group? It’s true, forums are not exactly at the cutting edge of the internet any more. However, they’re our own space, and they’re still the best place for in-depth conversation without distraction – conversations you can return to (and actually find) days or months later and add an update, or pick up where you left off. Do you include courses on Wen Wang Gua / Plum Blossom / this text-free method? Sorry, no – nothing like that. I’m dedicated to the Yijing as an oracle that speaks through its unique, rich fabric of words and structures, and I created Change Circle to support and nourish your relationship with this oracle. Hilary is a wonderfully creative and imaginative teacher. I really have never encountered anyone who explains things better than she does – and the I Ching is difficult to explain, which makes it all the more remarkable. 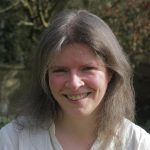 Over the years she has come up with many innovative ways of bringing the I Ching to people and fostering discussion and learning. You get a lot with a Change Circle membership. Do you have questions I haven’t answered? Then please use this form to ask them, and I’ll get back to you as soon as I can! Quality instruction in Yijing divination is hard to come by, but Change Circle provides a deep and engaging interactive course. Hilary’s interpretive strategies help cut clear through the fog, with opportunities provided for peer-reviewed practice in applying and integrating them. 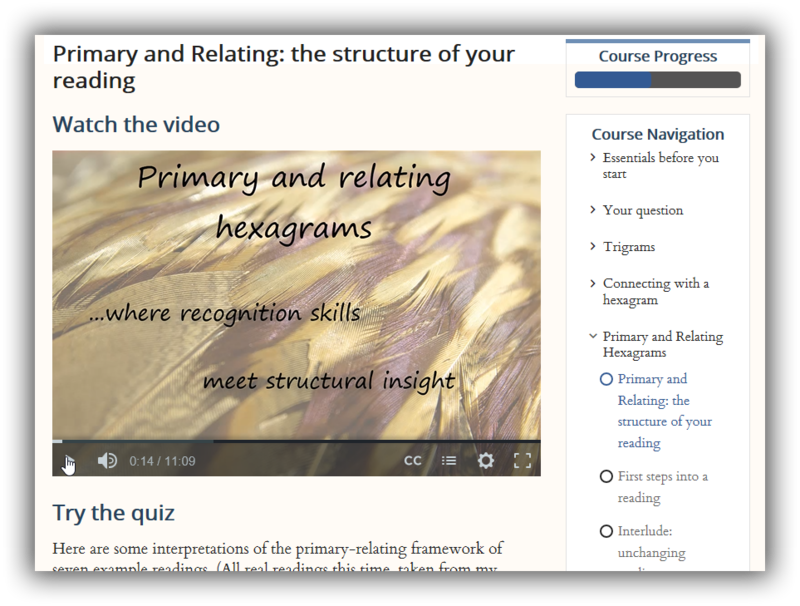 It’s structured in a way that it can be approached as interactively as you like, or accessed as reference material, and it’s easy to choose and to vary your pace and degree of interaction.